A new lesson! This is a fun lesson with lots of washes. The end result will have lots of textures and patterns that will tickle the eye. If you would like to get the drawing and photo references for this project, please visit my online etsy shop and click on the Online Class Icon. For $5.00 I will send you a pdf file with all of the references and the drawing so you can follow along. Most people prefer to order the references, and then print the daily lessons until they are complete. Then they use the printouts as a workbook to do the painting. Today I have just put the drawing on the watercolor paper by scrubbing a soft layer of graphite onto the back of my drawing. 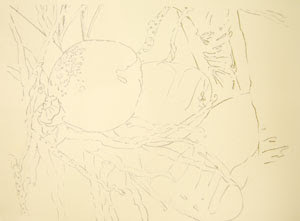 Then I tape one small spot on the drawing to the watercolor paper and lightly trace. It's really important to use a very light touch so that you don't deposit too much graphite onto the fragile watercolor paper. Remove the tracing, and tape your paper onto a foam core or gator board with masking tape. Now you are ready to paint!